The origin of magnetic fields in our universe is a mystery. But magnetic fields are a key part of the interstellar medium and scientists are finding they may play a major role in galactic formation, such as helping to form the spiral arms of galaxies. Until recently, however scientists believed the strength of galactic magnetic fields increased over time as galaxies matured, and in the early universe, these magnetic fields were initially very weak. But, recently a team of scientists looking back to probe the ancient universe as it existed 8 to 9 billion years ago has found that the magnetic fields of ancient galaxies were just as strong as they are today, prompting a rethinking of how our galaxy and others may have formed. Using the European Southern Observatory’s 8-meter telescope located in Chile, a team of scientists from the Los Alamos National Laboratory and the Swiss Federal Institute of Technology studied 70 galaxies similar to the Milky Way at optical wavelengths. They combined their data with 25 years of radio wave observations of magnetic fields that measured how far the radio waves were pulled toward the red end of the spectrum, known as “redshift” using Faraday rotation measures. Serving as a looking glass into the past, the powerful telescope at the European Southern Observatory, adding to the radio rotation measures, allowed the scientists to observe surprisingly high magnetic fields between 8 billion and 9 billion years ago in the 70 galaxies studied. That means that several billion years before the existence of our own sun, and within only a few billion years of the Big Bang, ancient galaxies were exerting the tug of these strong magnetic fields. Astronomers had thought a mechanism called a dynamo, which transfers mechanical energy into magnetic energy was responsible for galactic magnetic fields. In that case, with the right configuration gas flow could generate a higher magnetic field from a weaker seed field. (Again, we have yet to understand how galactic magnetic fields originally form.) But this new research suggests that the magnetic fields in galaxies did not arise due to a slow, large-scale dynamo effect, which would have taken 5 billion to 10 billion years to reach their current measured levels. This realization brings a new focus on the broader question of how galaxies form. Instead of the commonly held view that magnetic fields have little relevance to the genesis of new galaxies, it now appears that they are indeed important players. If so, strong magnetic fields a long time ago are one of the essential ingredients that explain the very existence of our galaxy and others like it. 99.999% of the visible universe is made of a quasi-neutral plasma. Any differential movement between the positive and negative ions will (a) produce an electric current (b) must produce a corresponding magnetic field. Hannes AlfvÃ©n deduced this around 1937. Not a big surprise for the realists amongst us. We live in an Electric Universe, after all. Magnetic fields a mystery? And all these years I thought that electric currents caused them. I guess that only applies on earth? Faraday must be spinning in his grave, like a dynamo. Precisely right Bill… Time to instigate revolution in the halls of academia? Quite simply, it’s been known since the times of Faraday, Ampere & Maxwell that magnetism and electricity go hand in hand. Magnetic fields are the byproduct of electric currents. The strength of the electric current determines the strength of the resultant magnetic field. In fact, in the lab magnetic field strengths are sometimes used as an alternative method for diagnosis for current strengths when it’s inconvenient/dangerous to interrupt a circuit and insert a galvanometer. Hell, has anyone in astronomy every heard of an ELECTROmagnet? Rung a giant electric current through coiled conductors to produce a giant magnetic field. Why astronomers fail to grasp this is beyond me. That’s how they do it in particle accelerators, etc. Are there currents between planets? and stars? to form a galactic magnetic field? I don’t see how a current could produce a magnetic field on the galactic level. Isn’t this still sort of a mystery, like Earth’s magnetic field? Also the sarcastic comments are pretty lame. You could have saved yourselves from looking immature by simply asking it in question form: “Wouldn’t the galactic magnetic field be produced via a current?” which then doesn’t seem to make as much sense, as I mentioned above. Yes, there are currents between stars and planets, as evidenced by the recent THEMIS re-discovery of Birkeland Currents, first verified in 1973 by the Triad satellite and first predicted circa 1908 by Kristian Birkeland. So, yes, currents do in fact flow in space through the ionized plasma permeating it. 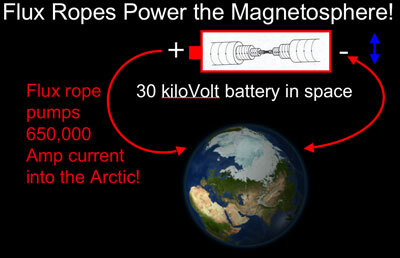 The magnetic fields seen in space are the results of electric currents flowing therein. It’s a rather simple matter of definition, regardless of whatever cognitive dissonance astronomers may have with the definition. In fact, plasma cosmology predicts that these currents and magnetic fields are one of the organizing forces of the universe. It’s not unexpected then that the universe display a fractal, filamentary structure, just as electrical discharges do in the lab. It also seems that PIC simulations based strictly on electrical interactions of adjacent interacting Birkeland currents have shown good agreement with ACTUAL galaxy rotation curves, whereas the gravitational predictions do not (hence the introduction of untested, more-or-less undetectable / unknowable ‘dark matter”). So, which model fits the actual data best is up for debate, I suppose, eh? Just my 2c, of course. >Wow Michael – thanks for the physics lesson; you have it all figured out! Let me put in a quick call to the Nobel committee. Maybe first though, just to clarify your ideas a little, you could suggest the mechanism through which the electric currents are forced to flow. How are they generated? What processes generate them? How do these processes arise? Is there only one process at work, or multiple processes? Does this fit with the otherwise known behaviour of such processes/objects? What is the magnitude of the currents generating these fields? What path do they take? On what timescales do they vary, if at all? What effect do such currents and fields have on surrounding objects and matter? See, this article touched on some of these important issues which these astronomers are pondering as we speak. So maybe they do actually have a basic grasp of Maxwell’s equations and physics in general (as having a PhD in astrophysics would tend to not-so-subtly suggest), and it may be better for your so-called “revolution in the halls of academia” may be best applied a little closer to (your) home. Just a thought. PS. Here’s a link to a lecture of Philip Kronberg’s, one of the astronomers in the article. Still think he doesn’t understand basic physics? Much has been learned in the past few decades that tends to discount the “Big Bang” and support the idea of a steady state universe (though not in the naive way of 100 years ago). The unification of Quantum Mechanics and General Relativity is one area that benefits greatly from the idea of a steady state universe over the current expanding universe hypothesis. Make you wonder if there were some hellacious lightening storms. Possibly another phenomena for which dark matter may be responsible for? You are using the right words, however they are in the wrong order and wrong way. I wont go into how an electromagnet works, there are plenty of places you can go for this. However, before you do, think about how electricity is created and controlled using magnets. Needless to say, there is more than one way to create a magnetic current or a magnetic item for that matter. I.E. magnetic rocks were found far before electricity was thought of. The basis of electricity and magnets is electrons and polarity. Perhaps this is how you managed to think whatever you do. With this story, perhaps you should think of magnets as a sort of “electricity detector”. In so far as the magnets polarity reacts to the charge of the electron as it flows by; and it is just possible the magnetic field is gravitating towards or reacting to some charge. However, before you demean and attempt discredit individuals who specialize and make thier life at something, it may be wise to get a full and complete understanding of the subject at hand. Fortunately, we don’t have to reciprocate in kind. You’ve already discredited yourself quite well. I look forward to hearing another one of your ignorant posts again soon… under another name I’m sure. I think the discussion cuts to the core of the “frozen-in magnetic field”. But Alfven warned of the misuse of this concept and its limitations. Clearly galaxies are highly dynamic systems. Their mag field is not constant. This implies time-varying electric and magnetic fields. Which comes first? All books and teachers of EM will say that currents are the source of magnetic fields. Even magnetized materials, seemingly static, have their magnetism based on domain currents. But who would say that a galaxy is a magnetized piece of metal? It’s stars (plasma things) and more interstellar plasma, and it all moves, thus its time-varying EM nature. As to where the energy to cause charge separation comes from, I don’t think we can easily know, any more than we can easily know the “why” of the hypothetical big bang of why we have a zoo of so many different particles. You’re right Bill, magnetism comes from currents in all phases. An organized current of electrons so to speak. Which came first is a good question as well… since the genesis of the universe is only theory; perhaps a good start would be to research magenetic fields in or around stellar nurseries; both inside and outside galaxies with large/small magnetic energy. apparently, the site or moderators decided that my second response clarifying several issues did not need to be posted. I’ll try to respond to a few issues. A 650,000 Amp current was found flowing between the sun and the Earth. A similar million Amp current flows between Jupiter and Io. Recently, it was found that Io is actually subject to “electron beams” flowing from one hemisphere of Jupiter to the other. It would not be surprising to find out this is actually a circuit which closes (either through Jupiter’s core or over its surface), as otherwise the discharge would eventually stop if sufficient charge were transferred from one hemisphere to the other and built up, thus neutralizing / equalizing whatever charge imbalance may have existed. So, yes, electric currents *DO* flow through the conductive interplanetary plasma. There is no reason to believe that similar currents do not flow in the inter-stellar or inter-galactic plasmas as well. In fact there’s plenty of anecdotal evidence for it. But, this should suffice for now on that topic. Asked and answered. I find many of those question interesting as well. Their investigation should yield interesting answers about the functioning of the cosmos. However, your statement that the article touches on electricity in the cosmos seems to be inaccurate. Can you please point out where in the article above it states that electricity has anything to do with the issue? the fact of the matter is that the article states that astronomers are confused about how the magnetic fields form. Until they tacitly acknowledge that there is a direct link between electricity (current strength) and magnetism (field strength), one must assume they do not have a grasp of Maxwell’s equations. Related articles have talked about “magnetic seeds” and other claptrap that avoids the issue. Plasma is not a permanent magnet. It does not “hold onto” magnetism. Field lines are not “frozen-in.” Magnetic fields derive from electric currents. strength of the current equates to the strength of the magnetic field, as I’ve previously stated. Don’t believe me, look it up. Sarcasm aside, it seems to be the relationship between electricity and magnetism that’s being missed. Once the relationship is tacitly acknowledged, the questions you’ve posed about where the charges are located, how the currents came into being, etc. become of paramount importance. So, on that point, I agree. But it seems like a good majority of press releases and papers talk about magnetic fields as though they are somehow self-generating or self-sustaining independent of electric currents. Not so. When current flow ceases, so too the magnetic field. Permanent magnets are likely a related phenomenon, wherein the electrons in orbit around nuclei move in non-random motion or in lock step with the electrons of other nuclei. IE, an atomic scale “current.” The curie point (whereat magnets break-down and lose their “magnetism”) is likely simply due to the fact that at that point the lock-step of electrons of some majority of the atoms breaks down and chaotic motion dominates. In any event, it’s really the definition of the relationship between magnetic fields and their source currents that needs acknowledgment and application to space. Where magnetic fields are seen it seems prudent to figure out how charges are moving in order to produce the magnetic fields detected. Plasma Cosmology does this to some large extent (in acknowledging that currents underly the magnetic fields and then attempting to back-track to / model the currents). Astrofiend: thanks for the link to the Kronberg piece. Classical shock theory (for CR electron acceleration) breaks down. IE, mechanical “smashing things together” doesn’t appear to work. No kidding! =oP Smashing things together isn’t he only way to accelerate charged particles. Electric fields / voltage drops work better. Just sayin’. Space plasmas generally cannot be “magnetized” nor “carry magnetic field lines along with them.” The magnetic fields result from currents in the plasma. Then he gets into “magnetic reconnection,” AlfvÃ©n ALWAYS considered magnetic reconnection to be pseudo-science. It just doesn’t work that way. See the prior reference for that bit too. See also Don Scott’s refutation of the same. Both prefer an actual ELECTRICAL model rather than improperly reinventing the wheel (with more or less square sides). He seems to recognize the issue, but not fully resolve it amicably. IE, there still appears to be confusion over the subject. What are you on about, exactly? I have never posted under any name other than my full name: Michael Gmirkin or my screenname: MGmirkin. I take umbrage at your insinuation, and ask that you retract your accusation. It’s quite improper. Please check your facts before stating someone does or does not know what they’ve already read about. What has one to do with the other? The chronological history of when magnetic materials was discovered has NOTHING whatsoever to do with explaining the WHY of the thing (in terms of what creates the magnetic field). According to Maxwell, electricity and magnetism are flip sides of a coin. Twirl a magnet in a conductive coil of wire, get an electric current. Put a current through a coil of wire, and you get a magnetic field. They are intimately linked. Further than that, they can interplay and interfere constructively or destructively leading to various specific known behaviors and instabilities. However, according to definition, the magnetic field comes from a net flow of like charges. Positive charges flowing one way, while negative charges are stationary or in chaotic motion; negative charges flowing the same direction while positive charges are stationary or in chaotic motion; or lastly, positive charges flowing one way and negative charges flowing the opposite direction in the same circuit. Actually there are a few other ways that things can go on including p-holes (in which an absence of a charge takes the place of an opposite charge, more or less), etc. But it’s generally the same song and dance, no matter how you slice it. These are the thing you learn when you actually READ about them. Somewhat extensively. Precisely right, the current Big Bang model is only a theory, which has a number of drawbacks / patchwork kludges where observations invalidated predictions. It would be good to study magnetic fields around star-forming regions, young galaxies, plasma filaments between stars / galaxies, or those in which nascent galaxies are apparently embedded. What role do the magnetic fields and their source currents play in the genesis of those structures. Precisely the point I was getting at. So, I think we agree there, finally… Glad to see you come toward light. Well, Earth is a charged body with respect to the upper atmosphere and with respect to space and other bodies in it. “What is the Earth’s charge? Clouds in thunderstorms will tend to have a lot of charged particles. If I recall correctly, they may also be somewhat segregated with positives near the top and negatives near the bottom. Being that the negatives are closer to ground, the spark gap is shorter and we tend to see more negative lightning strikes than positive (since positive strikes generally emanate from the tops of clouds and have to travel a further distance). Since the fields required to stimulate a positive strike are so much greater and there’s probably a lot more actual charges floating about in that case, the positive strikes also tend to be a lot more powerful if/when they do go off. I might also point out the difference between electrostatics (charges more-or-less at rest; as in the cloud or in the ground) and electrodynamics (charges in motion; as in the lightning strike itself). Electric fields generally tend to fall under the heading of electrostatics. IE, two oppositely charged clouds of particles some distance apart will have an electric field between them. Electric currents and the resultant magnetic fields, by association, tend to fall under the field of electrodynamics. IE, the charges in motion in a current / circuit generate the magnetic field. Stationary charges, or charges in random / chaotic motion do not. So, yeah, the more-or-less stationary charge in the cloud creating an electric field with respect to the more-or-less stationary charge in the ground would fall under electrostatics. When the electric field strength / stress becomes too great, a dielectric breakdown begins to ionize the normally insulating atmosphere in quantized steps (stepped leaders and positive streamers). Once a complete circuit of ionized atmosphere is made, the charges will very quickly start flowing in the circuit to neutralize the charges and bring them into equilibrium, at which time the electric field strength diminishes to a point where the lighting quenches and neutral atmosphere rushes back in to act as an insulator again. The lightning’s current flow falls under electrodynamics. Not to hard to identify the processes once you’ve read up on them and seen a few examples. Maybe Fritz Zwicky and Hannes Alfven WERE on to something. BTW, thanks to Astrofiend for the informative and accurate link. It delved into many relevant aspects of this subject. And thanks to Nancy for a great, informative article. Your original point was to demean scientists in their inablity to figure out the problem to a question. You pointed out one little pointed area, misparaphrased it and called yourself a genius. What is funny, is now you are searching the Internet, pulling down links to articles and proving just how difficult it truly is to emphatically state the real answer. There are many reasons for magnetism. Just because there is an electrical current abundantly near a magnetic field does not necessarily mean it is the source. Also what is funny, is you trying to explain to us how something works when we are hip deep in it every day. We don’t have to pull down the research of others. We have our own. Lastly, it is a desperate man who starts pulling in irrelevant information in some lame attempt to mask or saturate the real problem. Who cares about the earth’s electrical charges or magnetic field when it comes to this article? It isn’t relevant, nor a basis. If you somehow think it is, then you need to tie it into the equation, not just spout out the words of another. It is good you are researching things. However, every research paper has a theory. Doesn’t make it correct, mainstream or validated. Before you site one, ensure you fully understand all aspects of it, and it is relevant to the problem at hand. Bottom line… those who conducted this research know far more than you do about magentism, electricity, atomic polarity etc. Ask your questions, state your theories, but don’t for a minute dismiss or demean those individuals who provide the very words you have to pull down from the Internet in some crazy way for you to feel intelligent. Know some people who come here actually do know what they are talking about. Sorry, my wording was not meant to point to any mis-, or not understanding of electricity in myself, neither to start wars of words simply for the sake of that! I was simply trying to start motion in thought about all the static electric “lightening” found already all over our little solar system and the possibles of more in areas of galaxies and, indeed, possibly throughout the universe,some yet undicovered. Hmmm, that is perplexing then…. strong magnetic fields at formation and decreasing field strengths over the life of the galaxy. Perhaps this is related to the gravitational capture of ionized gasses in the interstellar medium. Or worse, perhaps it’s related to dark matter. Michael Gmirkin thx for all the info! Aodhhan, Michael has posted lots of material that you could have at least read before criticizing him. You have no idea what he’s talking about., but, as I’ve seen many many times, world is full of lazy people just criticizing the work of others that have real interest in the events and offer full support on the question asked. You just trust some scientists because you cannot study or understand the things yourself. Just think about the fact that they are admitting that they have no idea what’s actually happening, they are just speculating. This is what the article is all about, describing an event that they cannot explain on the current universe model. Michael offers good clues about what actually could be all about and it might actually be true; he didn’t came with these theories by himself, there are also scientists behind them, go figure that.